I’m standing on the southernmost point of continental Canada, a thin strip of rocky sand at the south end of Point Pelee, Ontario that’s roughly the same latitude as Rome and northern California. There’s a soft wind in the air and hardly a cloud in the sky on a perfect summer’s day as I pose for a photo. Seconds after I leave, a young couple takes my place and I snap a picture for them. And on it goes; a steady line of folks waiting to have an Instagram moment at one of the most iconic places in this vast, beautiful country of ours; grinning at friends or strangers who are more than happy to take a photo and help them capture a cherished memory. Of course, it helps that not only is Point Pelee National Park an interesting geographic phenomenon but also a pretty ribbon of land that juts out into Lake Erie and contains vast, leafy, sun-dappled forests, seemingly endless beaches and acres of serenely quiet marshlands that soothe the soul of a city dweller grown tired of honking horns and sticky traffic jams. A couple poses on the tip of Point Pelee, the southernmost point in continental Canada. It’s an easy spot to get to for eastern Canadians; perhaps an hour from downtown Windsor and four hours or so from Toronto. It’s also celebrating its 100th anniversary this year, having been formed in late May of 1918. The point can be reached on foot or by bike from the visitors’ centre. But the easiest way is to take a short (and free) tram ride, after which it’s perhaps a five-minute walk to the tip of the island. I take a tour of the sparkling visitors’ centre and learn about this “national treasure,” a place where migratory birds congregate in massive numbers in spring and fall, not to mention bats and monarch butterflies. Some 370 species of birds have been spotted here over the years, a truly remarkable number. The park, Canada’s ninth national park for those of you keeping score, is home to 17 species of reptiles and amphibians; four of them rare, threatened or endangered. You’ll also find eastern moles, mink, turtles, coyote, deer, and many other animals. They’ve built a lovely new facility at Northwest Beach, including change rooms, outdoor showers and a playground for kids that features lots of wood and natural surface. I explore the area briefly and watch a pair of young girls struggle with a colourful kite on the beach. A new observation tower near the southern tip of the island is being built, and it sounds like it will be a great addition. There’s already a fine tower (and not too steep; maybe 50 steps) overlooking the giant marsh on the eastern side of the peninsula. It’s a wonderful spot, with sweeping views of waves of deep green reeds and cattails waving in the breeze and dazzling sunshine bouncing off the dark blue water. There’s also a boardwalk that wraps around part of the marsh if you want to get up close and personal with the plant and animal life. You’ll spot lovely white and yellow flowers floating on green lily pads, as well as a variety of birds. 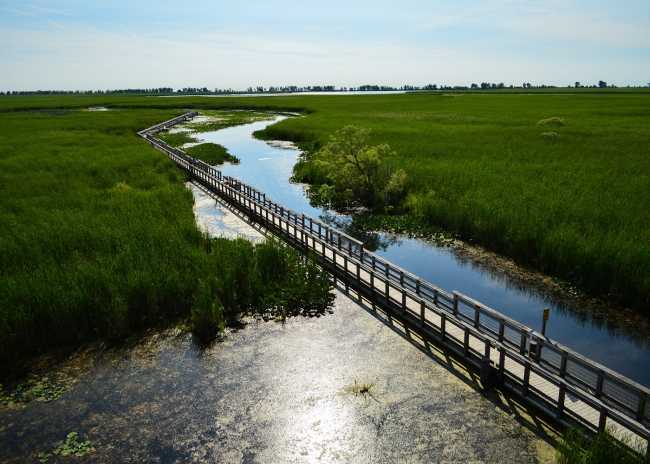 Point Pelee National Park offers canoe rides and rentals through a beautiful marsh. The park offers canoe rides and canoe rentals, which are great ways to enjoy the scenery. I had a canoe to myself with a local parks worker, Laura, who told me about the plants and the marsh as we glided along, listening to the sound of frogs croaking in the distance. For example, did you know that the word “marshmallow” came about because folks used to get sugar from the inside of mallow plants that grow in a marsh? Laura also told me that the fuzzy, brown part of a cattail can be eaten like a cob of corn, while the middle of the reeds taste like cucumber and the bottom parts have the flavour of a potato. We didn’t try any on our trip, so I’ll have to take her word for it. One area of the national park you might not know about is the Point Pelee Cemetery. It’s on the free map they give you when you pay your admission fee to the park, but it’s not well marked on the island’s trail system. I found it just north of the island’s cactus field, where you’ll find prickly pear cactus growing in the wild. It’s a beautiful, mysterious spot that’s tucked away off the trail, with perhaps 15 or 20 headstones and unmarked white crosses, many of them lined up in a row. A bit spooky for some, perhaps, but I found it strangely beautiful and peaceful. Tourism is obviously a huge part of the economy around Point Pelee, and you’ll find a ton of restaurants and hotels just outside the park boundary in the city of Leamington. I bedded down for the night at the Best Western Plus Leamington Hotel and Conference Center, a comfortable spot just north of the park that features nice rooms, a restaurant and a truly massive indoor swimming pool with two slides, as well as ping pong, a basketball court, video games, foosball and a climbing apparatus that had to be two or three times bigger than the larger ones you sometimes see at McDonald’s. I was there on my own but it’s a fantastic spot for families, and both the play area and pool were packed with kids and parents when I strolled past. Fresh local perch is a specialty of the house at Freddy’s, a fun restaurant in Leamington, Ontario. Just around the corner is a casual, lively restaurant called Freddy’s, where I sit on a sunny patio across the road from Lake Erie and dine on local perch done three ways; broiled, blackened and coated with coconut and dive into a small bowl of Toum Dip, a Lebanese garlic dish that’s served with pita bread and olives. Makhlouf’s family is from Lebanon, so he likes to mix in some Middle Eastern dishes along with the fresh fish they’re famous for. I don’t want to give it away, but Makhlouf and his family have a pretty cool expansion plan in mind that includes a boutique hotel; a project I think would utterly transform the area. My other meal in Leamington is an outstanding lunch at Salsa Caliente, one of a surprising number of Mexican and Latin American restaurants you’ll find in the city. The place is run by the Zavala family, and Armando Zavala handles a lot of the work up front. The food is fantastic; some of the best Mexican cuisine I’ve had in Canada. Armando tells me they make everything fresh and from scratch, aside from the imported tortillas and the Mexican pop (try the grapefruit flavour, by the way). Their salsa is terrific, and the chicken enchilada comes with tender meat and just-right spices. I also loved their chorizo tacos. Armando Zavala helps run Salsa Caliente restaurant in Leamington, an outstanding place for Mexican food. Zavala tells me he came to Canada from Mexico in 1993, and that his wife arrived in 1982. “We love this country so much,” he tells me. “I used to drive trucks for a living and I had to go Florida. Whenever I got back on the bridge to come home to Canada I would breathe a sigh of relief. The food is terrific, but listening to Zavala talk about his city and his country is the best part of my day. Seacliff Park in Leamington has a great beach, with warm water, beach volleyball courts and a new amphitheatre. After dinner, I take the advice of the tourism board and head down to the waterfront at Seacliff Park. It’s a huge swath of green space that rolls down a gentle hill toward Lake Erie, with playground equipment, a splash pool and a new amphitheatre down by the lake. I think it’s one of the prettiest parks in the country, and it’s wildly popular on a summer’s day. The beach is deep and the water is warm when I visit in July. It’s early evening but there are still folks out swimming and sun tanning. The beach volleyball courts (I didn’t count but I think there are eight of them) are packed. A little to the east is a lovely lakeside park, just past the Pelee Island Ferry, is a brick walkway that’s lined with lovely flower gardens on one side and a pretty marina on the other. Past that is yet another park with a fine playground and then the Leamington Municipal Marina, where they often have free weekend concerts. I stop in and listen to a lovely female singer and guitar player, who does a fine job with tunes from Fleetwood Mac, Sarah McLachlan and The Pointer Sisters as the sun dips behind the gleaming white boats in the marina. Sweet Retreat ice cream in Leamington is a bright, cheery place with a gorgeous garden out back. My final stop is Sweet Retreat, an ice cream shop just off the main street in town. It’s a marvellous spot with Ontario-made ice cream, as well as shakes, sundaes and other treats. There’s a small patio out front and it’s done in wild colours that resemble a cone of rainbow sherbet. They also have added a handicapped ramp so folks in wheelchairs can get into the shop, which sets a meter or two above the sidewalk. The interior is bright and cheery, but it’s the backyard garden (Pat and Bob, the couple that own and work in the ice cream shop live in part of the building) that really blows me away. There’s a small pond filled with carp, as well as strings of lights, a gazebo and dozens of Muskoka chairs painted in cheery pastel shades. It’s a gorgeous night, with the light from the west cascading through thick, towering trees. I nibble away at my strawberry ice cream cone and take in the magic of an Ontario summer night. Read more of Jim Byers&apos; travels on his blog here.